I wanted to take a moment to Thank everyone for their support to the APF. What a difference you all make. We have made some headway with all the types of Porphyria. With your continued support, fundraising opportunities, support for fellow members we are all playing an important role. The Doctors are working so hard for us all lets show our appreciation and we cant forget those who work in the office many hours a day. So please take a moment a just say Thanks to all. I hope everyone has a fine weekend and takes care of themselves. If you have not signed up for the blog take a moment to do so today. If your already on have you donated to firstgiving.com we have so many ways to donate Rob is walking 100 miles outside, many are walking, some are setting up a band benefit and the wristbands are still coming in it all goes to the best cause the APF, training new Doctors for the future, and so much more won't you do your part? 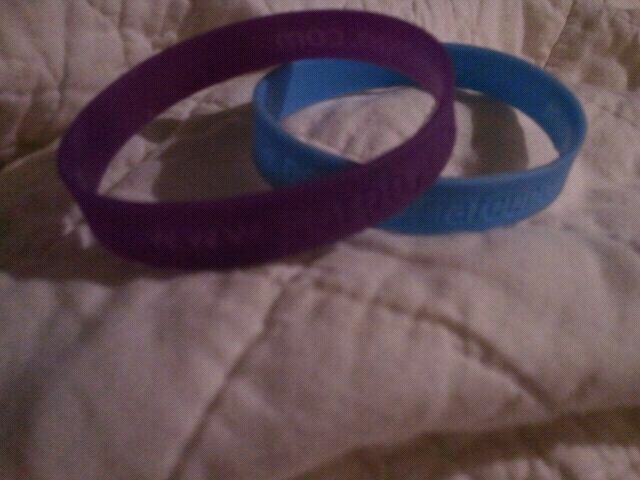 Your Choice is Light Blue OR Purple and they read: www.Porphyria Foundation.com. Please take a moment and ask your friends and family to help donate to this very special cause. I will be taking orders by Email they will be 2/4.50$ US residents. They are all 100% Silicone. I where mine all the time it shows how important the APF is to me, it serves as a reminder to me that I have a rare disease and also helps to show the Medical Staff that I have this disease to. · Health, as Attitude, can be defined as being successful in coping with pain, sickness, and death as a Normal Vicissitude of Life. And, successful coping requires always being in control of your life. · Health belongs to the individual. And, the individual has the prime responsibility for their own health. · The individual's capacity for growth and self-determination is paramount. · Health care professionals cannot empower people; only people can only empower themselves. · You Hold the Power, If You But Grasp It! The APF is working on an effort to ensure access to life-saving porphyria medications and ...........We need your help! Over the past several months, we have heard that some of our members may have experienced problems obtaining needed medical treatment in the hospital inpatient setting, and we are concerned that this may be limiting patients' access to Panhematin®, a crucial but costly medication that is the only approved drug for the treatment and prevention of acute porphyric attacks. As a result, the APF has recently appealed to Medicare to change its policy so that hospitals can continue providing porphyria patients with the medications they need most. However, to support this effort, we are asking APF members to provide their feedback about access problems faced in the hospital inpatient setting. The APF will share some of your feedback with Medicare but, as always, will preserve the confidentiality of its members (i.e., all responses will be completely anonymous). We hope that the comments will demonstrate the very real problems that are faced by patients who suffer from porphyria and will prompt a policy change. If you are a Medicare beneficiary and have experienced access problems in the inpatient setting, please email your story to Desiree at the APF office, lyonapf@aol.com. As Always, we thank our members for taking the time to help in this very important effort.